How should we address privateering as a business involving risk and return? And how should we measure the risk that privateers took? Sheryllyne Haggerty’s new article for the International Journal of Maritime History (see link below) addresses these questions by examining the networks of investment in privateering and the ways in which different Liverpool businessmen shared the risk of such endeavours. Privateering has often been seen by historians as the work of reckless desperadoes, risking all for one huge payoff. However, Dr Haggerty argues that if we examine the networks of investors in Liverpool during the Seven Years’ War, we can see that they saw privateering as a business not that different from other dangerous sea-borne trading endeavours such as the slave trade, also a key feature of Liverpool’s trade. Dr Haggerty’s work measures the extent of risk taken by networks of investors in privateering. 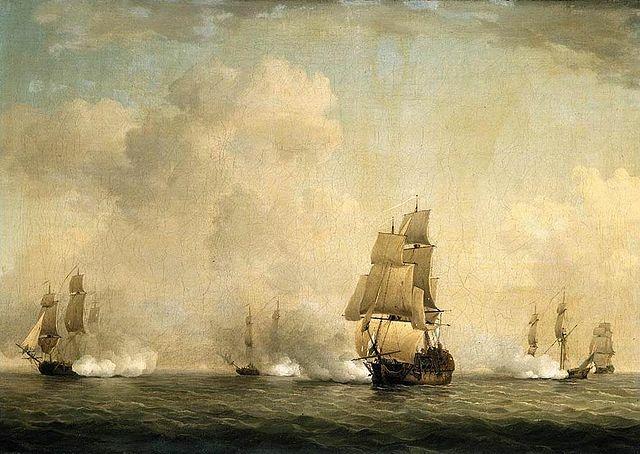 Far from being a marginal feature of maritime war, privateering flourished in the eighteenth century with 306 licenses for privateers being taken out by Liverpool merchants alone during the Seven Years’ War, and 1384 during the American War of Independence (1776-83). There were 295 individual privateering voyages from Liverpool during the earlier conflict with France, and these networks of investors can be pieced together from the declarations made in the applications to the High Court of Admiralty for such licenses. From those we learn that two types of privateers operated: one making risky deep-water forays into the Atlantic and Caribbean, and another less perilous, skirting the French and Spanish coasts. In all, 61 different Liverpool merchants were involved in the riskier deep-water voyages at least once. This was quite a sizeable part (27.85%) of the port’s merchant community, which numbered 219 by 1766. If we compare the size of these networks to those of the slave trade, we can see that the mean network size for deep-water voyages was very similar to, if slightly larger than, the average size of Liverpool’s slave trade networks at this time, suggesting that both enterprises shared a similar status in terms of risk and reward. Deep-water privateering was considered slightly more risky, but the networks were larger to spread the risk. Rather than being desperadoes, merchants involved in privateering were making rational business investments. Sheryllynne Haggerty, “Risk, Networks and Privateering in Liverpool during the Seven Years’ War”, International Journal of Maritime History 30, 1 (2018), pp. 30-51.